This WW2, Italian military truck was one of Italy's most common off-road military trucks serving in Africa, Italy, the Balkans and Russia. Dovunque roughly translates into off-road, or go-anywhere. This vehicle is a development of the earlier 2-ton capacity Dovunque 33 truck, being improved to a 3-ton capacity with a 60 hp 4-cylinder engine. It was a 6x4, indicating six wheels and four (the rear) wheel drive. So despite being an off-road truck is was not all-wheel drive. The truck was produced by the Spa company, which was a subsidiary of Fiat Company. Like the Fiat 626, the Dovunque 33, 35 and 41 trucks were a COE type (Cab Over Engine) which allowed a shorter wheelbase for the size of the bed. In the mountainous terrain of Italy and the Balkans this helped mobility on the narrow roads. Sounds like some good diorama possibilities! The resin molding is overall well done with good, crisp detail. Some white metal parts are a bit thick, particularly the steering wheel so I replaced mine with a more in-scale steering wheel from another model. 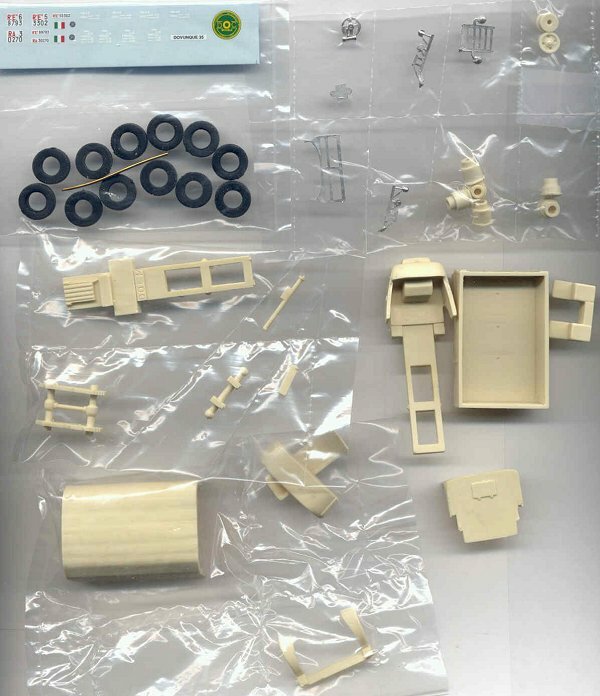 Above are the kit instructions with a parts list in both Italian and English. The translation to English is a bit rough but understandable with the drawing as a reference: for example, the "back and central stocks" are the tire rims, the "fly wheel" is the steering wheel. Though the 3-view drawings are well done and helpful I would have preferred several exploded-view drawings to better help figure out what goes where. Clear photo references of this truck were very hard for me to find and I had to do some hard dry fitting to figure where some parts go. Fit was good with little clean up of pore stubs. I did have trouble with getting a smooth fit with the front fenders (Part 11). Because the wheels are so far forward and therefore visible, I regret not scratchbuilding a new front suspension with a more accurate axle, springs and wheel hubs, etc. In the photo above you can see what I mean, the insides of the wheels are not accurate. While on the subject of the wheels, even with super (cyanoacrylate) glue, my tires would not stay firmly on the wheels. Try white glue, let dry real well, and treat them gently. [Glue the finished model to a base before final weathering to keep the model clean and protected. The truck bed (part 5 the body) has a good texture of wood boards. If you wish the rear tarp open to view the bed I recommend that you add the inside tarp frames that hold up the tarp. From a WW2 era photo of this truck, I saw that it had a series of slats under the tarp to create a stiffer, well supported cover. A small sheet of clear plastic was provided by DOC to cut a windshield, though mine was warped so I had to cut one from some clear styrene I had. For the lower, narrow, windshields I used Krystal Klear. If you are going to add a driver, make sure to fit him and glue him/her in before gluing on the canvas cover (part 3) over the cab. In the photo below you can see how rear suspension can be articulated for rough terrain. The truck colors on DOC's boxart show it in a very light olive with a light gray tarp/canvas. From several books on Italian WW2 vehicles I understand that the typical Italian colors were a gray-green for continental vehicles, and tan for African vehicles. I am sure there were exceptions to this. 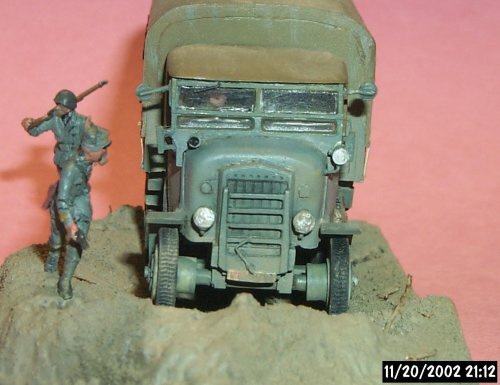 For example, I have one color photo of gray-green Italian Lancia trucks in Tunisia, and tan vehicles in Sicily and Russia. Often, green camouflage spots or lines were added to the tan. An overall olive-green color and German markings are plausible to me as well. 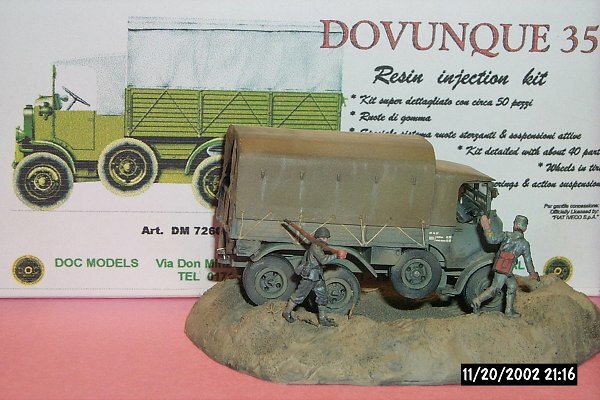 I chose Poly-Scale German Field Gray uniform color for a Dovunque truck in the Donbas area of Russia, late summer 1942. 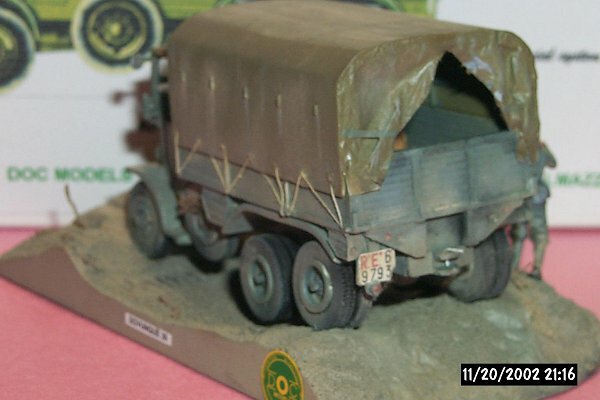 The tarp was painted olive drab so as to contrast with the vehicle color. After adding a wash to recesses, I repainted with a lighter hue of the gray-green color, concentrating the bulk of the lighter color in the center of each area. The soft rubber wheels were left their natural black-gray color though were weathered with paint to represent dirt, matching the base color. The model decals supplied by DOC include several white (vehicle loading?) markings for each the side of the cab. Three different license plate decals are supplied though I had to scratchbuild license plate holders for the front and rear. The DOC water slide decals were in-register and went on well. I was thrilled to find this vehicle available in small scale and recommend it as a display model or for wargaming. 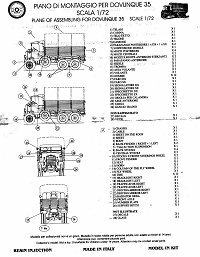 DOC has, or intends to release it in versions of a hard body radio truck (#72604), and an armored Dovunque Protetto truck (#72606). 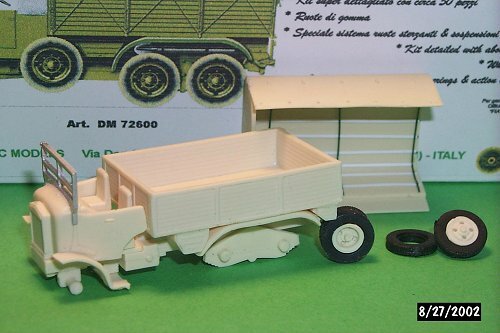 Other 1/72 scale DOC vehicle kits offered are the Italian WW2 era Fiat 626 COE type trucks, Lancia 3 RO heavy trucks, the TL 37 tractor, and an AS 37 Sahariano light truck. I purchased my Dovunque 35 kit from Philip at Tracks & Troops, Belgium, with prompt and friendly service. I thank Lorenzo Tonioli of Italy for all his assistance with reference photos and information.